We woke up to a hard frost that did not thaw until after 9am. Riding a bicycle in late October can be just as pleasant as riding one in June, but you only get a few hours a day to enjoy yourself. Tania left to go to work and we set off just before 10 am with 70 miles and the Green Mountains in front of us. We knew the sun would set at 6pm sharp. 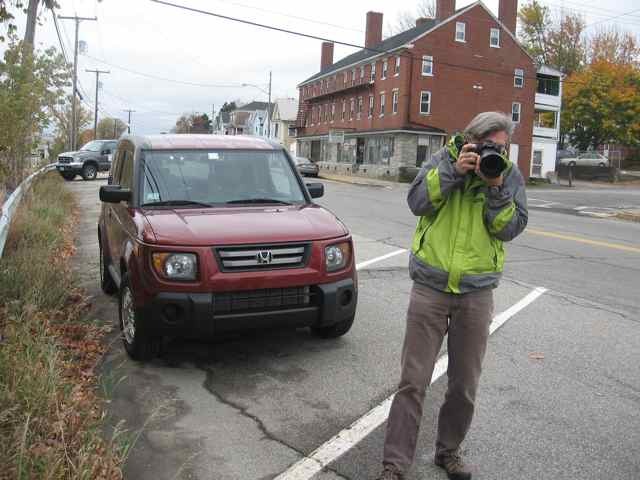 We would spend the day on Route 11 in Vermont and New Hampshire. 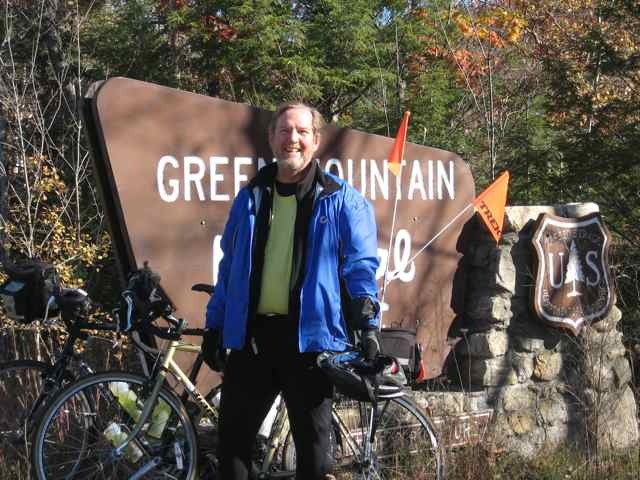 Maybe the months of riding had toughened us, or maybe we had scared ourselves with too much advance information, but the Green Mountains weren’t nearly as challenging as we expected them to be. We climbed for about five miles and the road leveled out and we were soon coasting and climbing, the hills small and manageable. 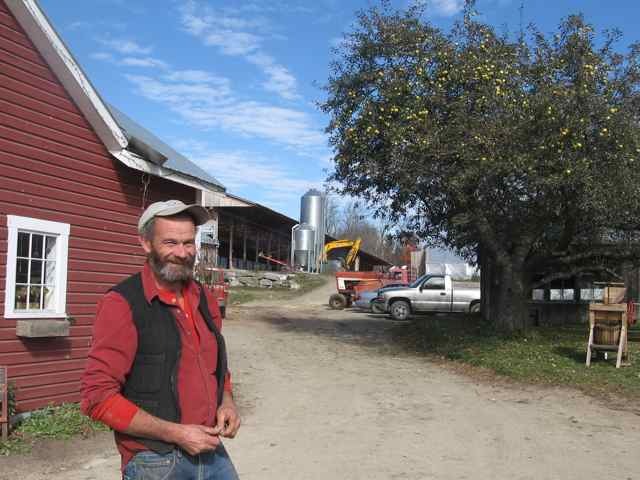 We stopped in Londonderry to talk to John Wright of Taylor Farm (see separate post), then pressed on. We were hungry by the time we reached the next town, Chester. 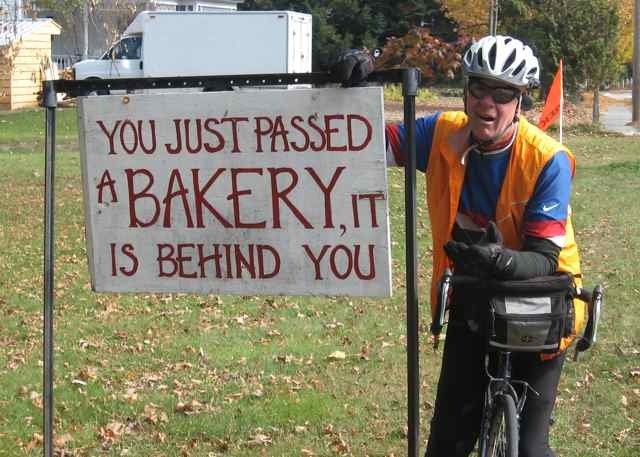 The big disappointment of the day came when a bakery that we were counting on had closed. In the off-season in tourist areas, people often close on a whim. Just down the road was an old building with an interesting-looking café and two young women behind the counter. We ordered two lunch specials and two hot drinks, sat in two mismatched but interesting chairs, listened to pleasant music featuring a woman singing in a foreign tongue, and wandered around the racks of bulk nuts, vitamin supplements, and stones with words like “imagine” carved into them. Jim got into a conversation with one of the woman, who said that she was from South America, her husband was a shaman, and that every year they went to the Pine Ridge Reservation in South Dakota to encourage Native Americans to re-connect their ancient memories with the legends of South American tribes, because they were all the same thousands of years ago. Then we paid up: $28. “That was a fantastic experience,” said Jim, with no trace of irony. “We’ve been Vermonted.” Earlier he had wondered aloud how all these people made a living. 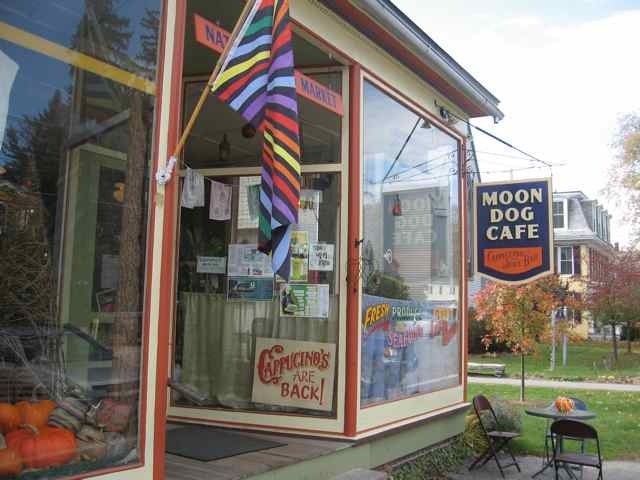 The Moon Dog Café gave us our answer. They sell $14 sandwiches to people like us. 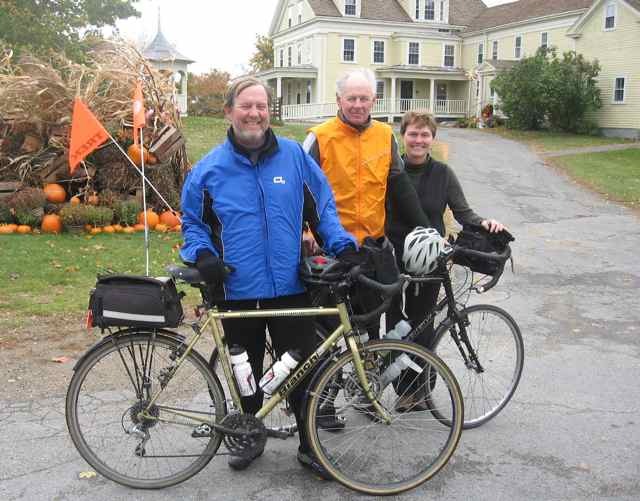 We rode over a ridge and down into Springfield, a congested mill town that fortunately had bike lanes and a bike path. 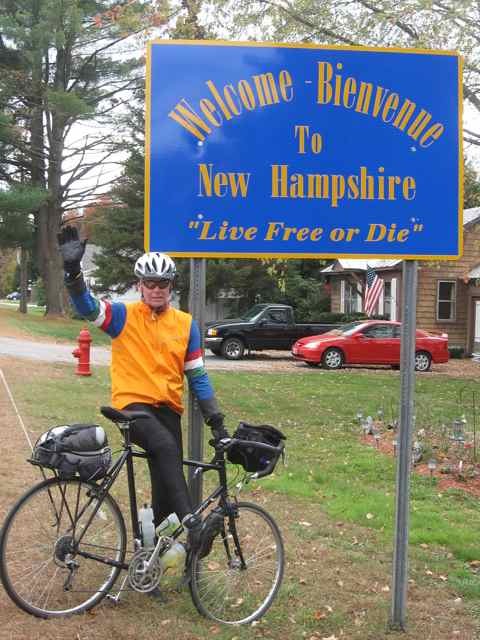 Then we crossed the Connecticut River and entered New Hampshire, and the next thirty miles were a slog along a busy highway and a really long commercial strip that ran from well south of Claremont to well beyond Newport. Fortunately route 11 had a wide shoulder, so we never were in danger, but the noise and anxiety of heavy traffic nearby took their toll. Clouds were thickening and the light was failing when we started up the west shore of Lake Sunapee. Sara had found us a two-bedroom cabin with a kitchen, so we ate in, watched satellite TV, and plotted the last two days of the ride. Rain was predicted. 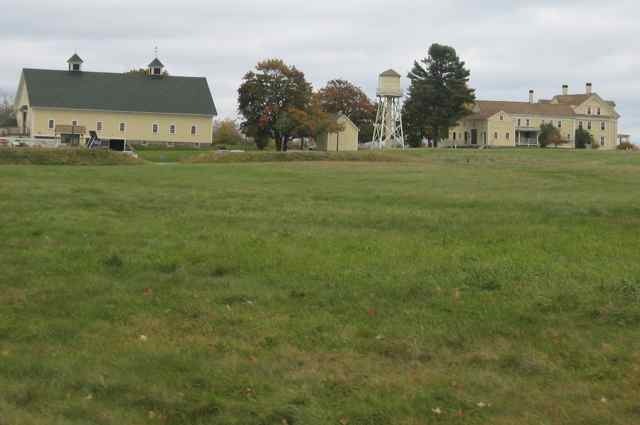 Taylor Farm was one of the Vermont Land Trust’s first forays into agricultural easements, which have since become a major focus of the organization. 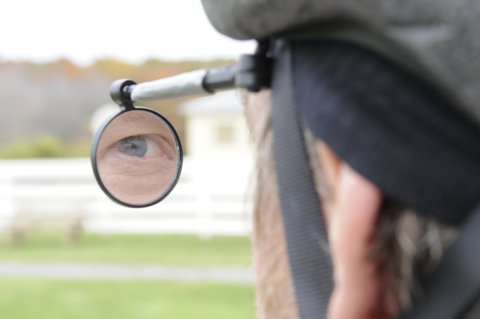 Over 97% of respondents to a survey completed by the Council on the Future of Vermont said that they value the state’s working landscape and heritage—more respondents agreed on this than any other statement in the survey. When asked about the challenges facing Vermont, over 92% of respondents said that they were concerned about the health and viability of Vermont farms and the agricultural sector—making this the second highest concern of respondents overall. 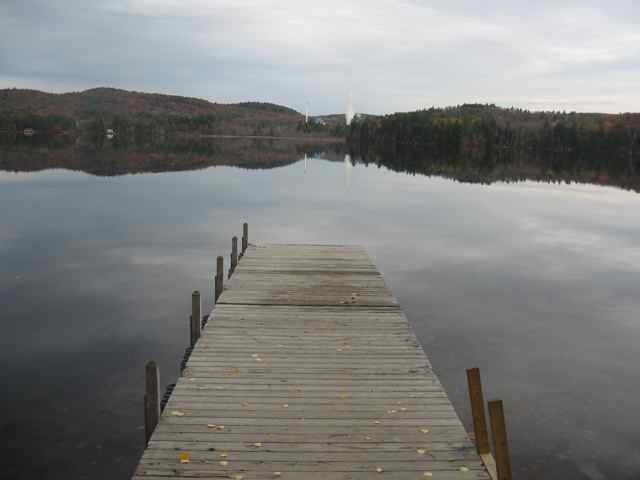 Our cabin for the night was on Little Sunapee Lake, and we woke up on Tuesday, October 21st to a view of perfectly calm water. The morning weather forecast said the rain wouldn’t start until around nightfall, so we set off at 9am under mostly sunny skies. It turned out to be a beautiful day for a ride – slightly warmer than the last few days, with brilliant sunshine poking through and fall scenery that was still spectacular. Unfortunately for us, New Hampshire is a densely populated state. 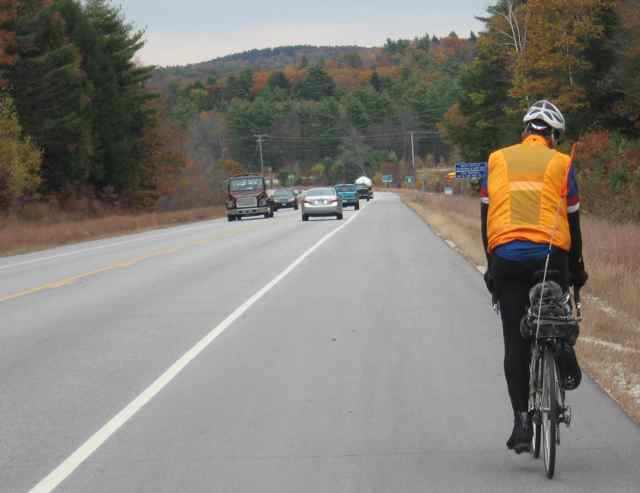 A lot of our ride on Tuesday was along busy highways, We were relatively safe because the state has put wide shoulders along most of its roads, but it’s strictly business when you’re riding in highway traffic. I didn’t take many pictures. 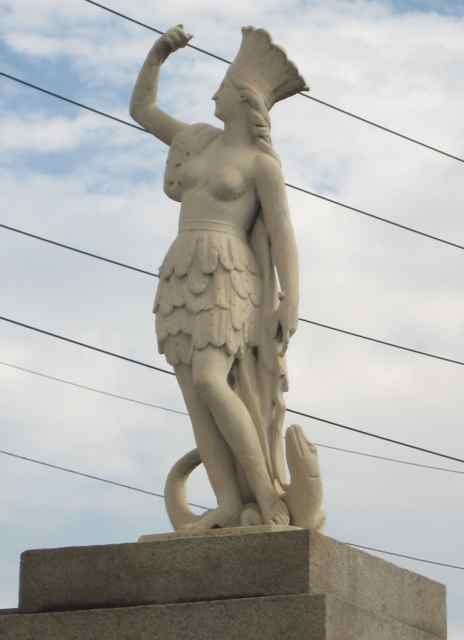 We rode through New London, Andover, and Tilton, which had a statue in the middle of the highway that was just too weirdly beautiful to ignore. Then we went on to Franklin, where we got off Route 11 and the traffic fell away. We started toward Rochester on state route 140 and went through Belmont. Jim explored the public library building, and reported that it was really old and that the door made a scary squeaking sound when you opened it, but that the two women inside were very friendly and the bathroom was clean. We ate lunch at the town’s one diner – it was a new place, and they didn’t know if they could make a grilled cheese sandwich. “How can you not know how to make a grilled cheese sandwich?”, asked Jim. 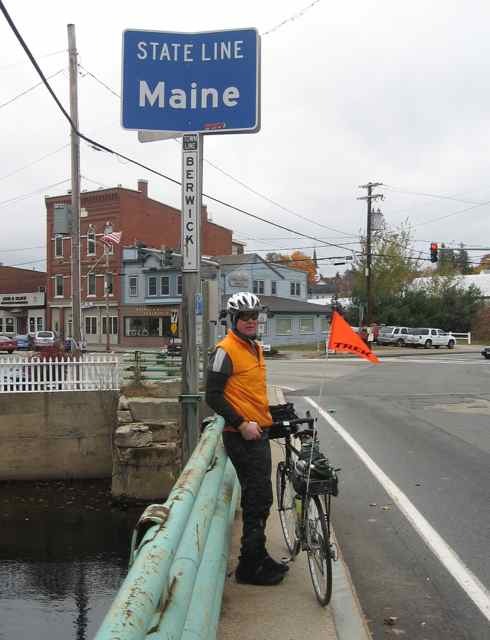 Most of the townships we rode through had welcome signs that gave their founding dates, and most of them were settled well before the Revolutionary War. 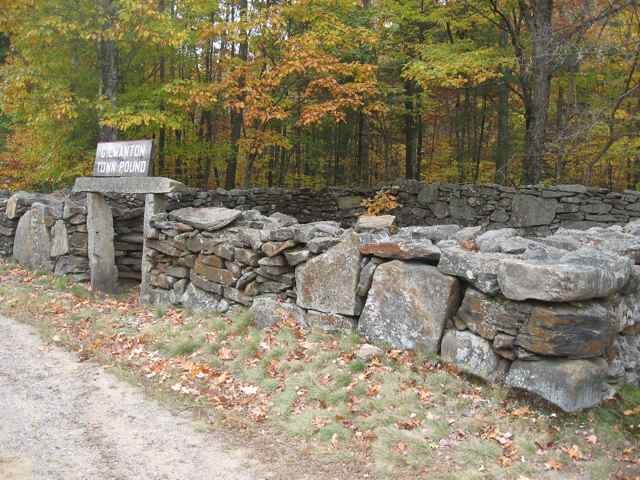 We rode past the Gilmanton Town Pound, a corral of huge old stones that was used in the early days to safeguard cattle that had wandered off their owner’s property. I hope they still use it sometimes. A marker told us that the rural road we were following was the “Old Province Road,” one of the first highways in New Hampshire. It was authorized in 1765 to supply northern settlements from the tidewater port of Durham. Many of the houses along the road were from the 18th or early 19th century, and the scenery was probably the same for us as it had been for travelers 200 years ago. We were finishing our ride down the hills toward the coast. At one point we crested a small rise and thirty miles of plains lay in front of us. We probably could have seen the ocean if the clouds hadn’t gotten in the way. It might have been a 240-year-old highway, but it was also very much in the here and now. New Hampshire was a battleground state in the 2008 Presidential election, and we saw more signs for McCain than for Obama in rural New Hampshire. But the closer we got to the coast, the better Obama showed. More impressive was the profusion of lawn signs for local offices. 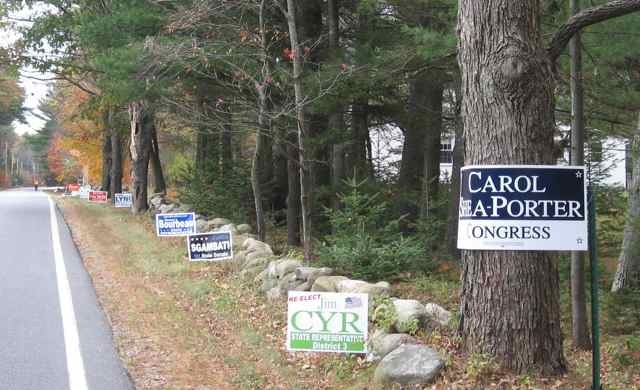 They really like electing people up here, and they really like lawn signs. Or maybe it’s just that the election was just 13 days away. We rode through Rochester as the first sprinkles of rain started. We were safe in the motel Sara had found for us by the time the weather got yucky. It was the second 70-mile day in a row and we were beyond exhausted, so we ordered a pizza and zoned out on TV. We noted tomorrow’s forecast: much colder, with a strong north wind. Yet we only had 25 more miles until the end of the trip. At that point, I was so eager to be finished that I would have done it naked. 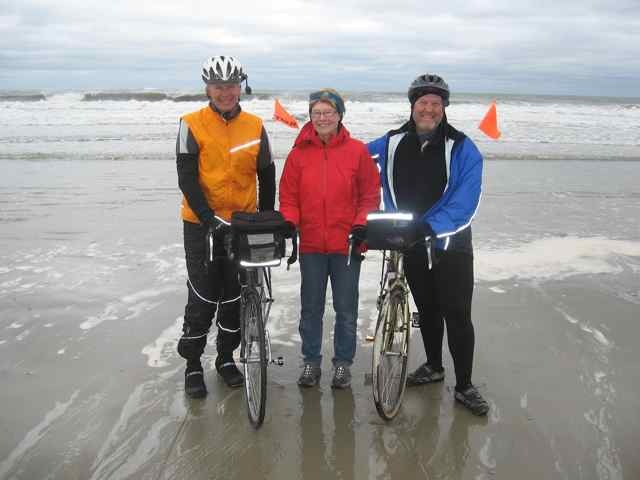 Our ride ended at the Wells National Estuarine Research Reserve in Wells Beach, which is located on a preserved 2,200-acre site stitched together from five old coastal farms. Farmers began cultivating this land in the 1670s and kept working it for 300 years. When the last private owner died, local residents formed the Laudholm Trust to buy and manage the properties. The 1910 owners gave the name to the main home and barn complex by combining “laud,” to give praise, with “holm,” a meadow on the shore. The Farm Trust was established in 1982, and the Reserve was dedicated in 1986. The Trust now has about 2,500 members. Wells is one of 27 National Estuarine Research Reserve sites scattered around the country. 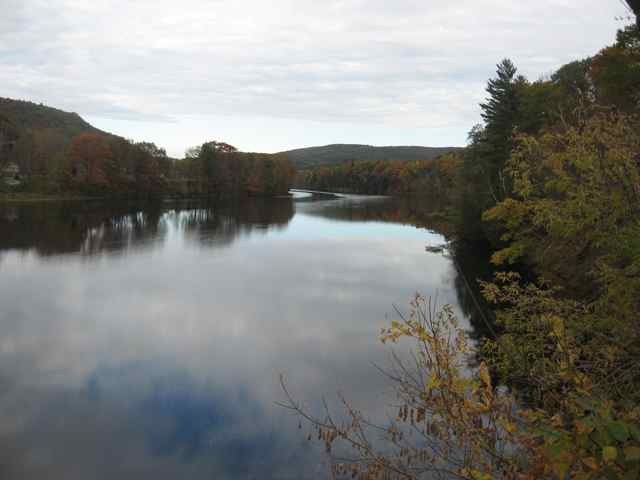 State and local sources are the base of support for these sites, and the National Oceanic and Atmospheric Administration matches their support with a federal grant 2.3 times the original amount. Wells is the only site that relies on a private not-for-profit organization as the local source (all the others have state funds). 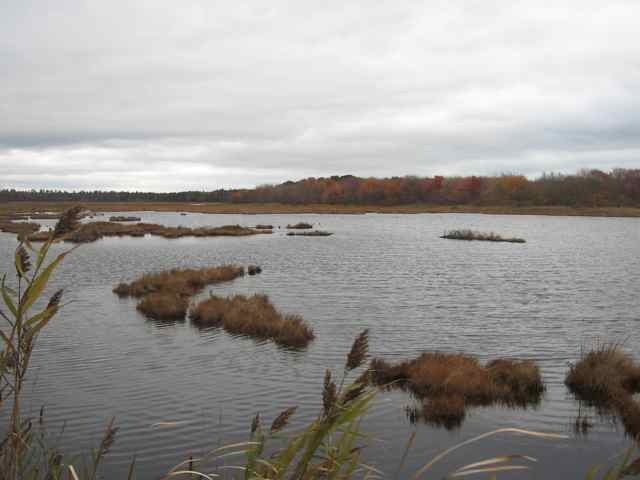 The Reserve monitors the health of Maine’s estuaries, which are under increasing pressure from housing development. “We’re trying to show how commercial fishing and community clam beds depend on clean water. People need to understand that degrading those estuaries has an economic impact on the state, “ says Jeremy Miller, a researcher at the lab. The rain tapered off and left behind a stiff north wind. Added to an air temperature in the 40s, it meant that our last day was also one of our coldest. 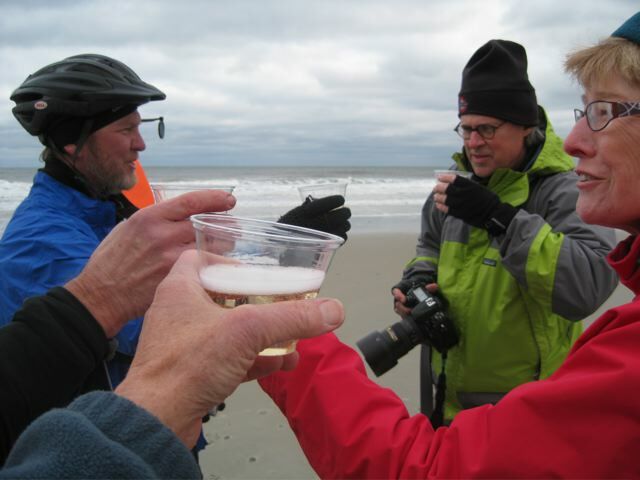 We left around 11am after my old friend Jon Crispin, a professional photographer, showed up to record the festivities. 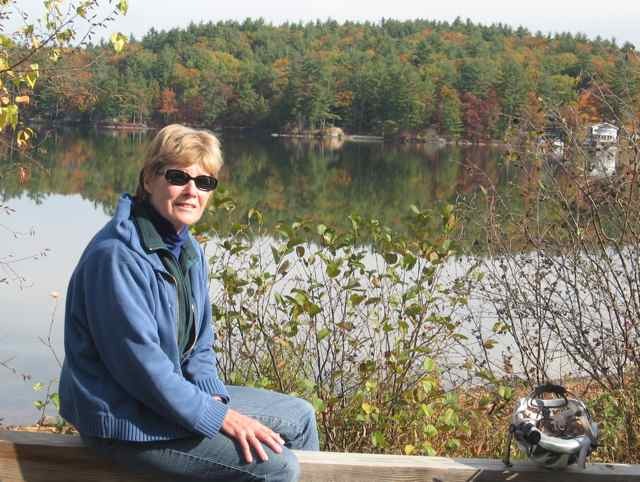 We had 25 miles to go before the end of the trail at Wells National Estuarine Research Reserve in Wells Beach, Maine. Traffic remained heavy but we were sheltered from the wind, and before too long we crossed the state line and turned east on state route 9. The road was flat and before long the buildings thinned out. We rode thorugh a coastal deciduous forest that was being stripped of its leaves in the raw wind. 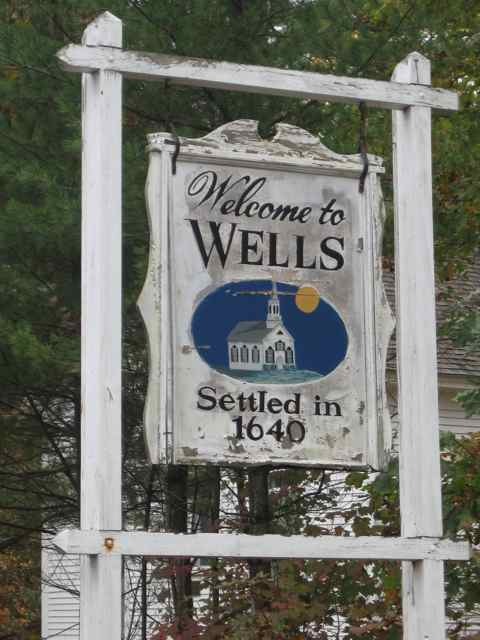 We reached the town of Wells and turned north on US Route 1, picking our way through the cars and broken asphalt and closed fish-fry restaurants until we reached the entrance to the Reserve. It is a beautiful spot, a preserved farm complex on 2,200 acres, and we spent an hour talking with scientists and the President of the Board about its dual mission of research and education (see separate post). About 2:30 pm we threaded our way down Drakes Island Road to the Preserve’s beach, where we ceremonially dipped our tires in the water. We also unveiled the hat of Al Craig, in whose memory Jim and Sara made the trip, for the last time. Sara brought some bubbly and we had a toast, but it was too cold to stay long. So we went to a nearby restaurant and said our goodbyes over tasty bowls of real clam chowder. Then it was time to disband. The trip ended well. 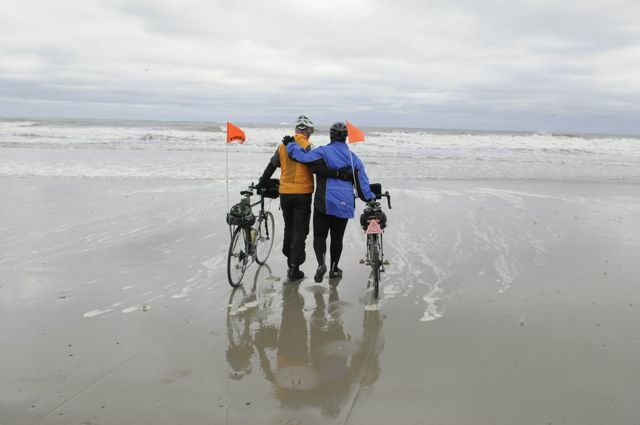 We finished in good shape physically, and Jim and I still like each other enough to plan more rides together. Not until it warms up, though. The three of us finished up so tired, and with so many unprocessed memories and emotions, that we all felt stunned. In the weeks after the trip ended, some of those memories came bubbling back up in my mind up at odd moments. It made me think of a big pot of soup simmering on the back burner, its flavor changing slowly over time. This trip will be nourishing us for a long, long time.